Smokey here is one of the many stray cats that live in our backyards. 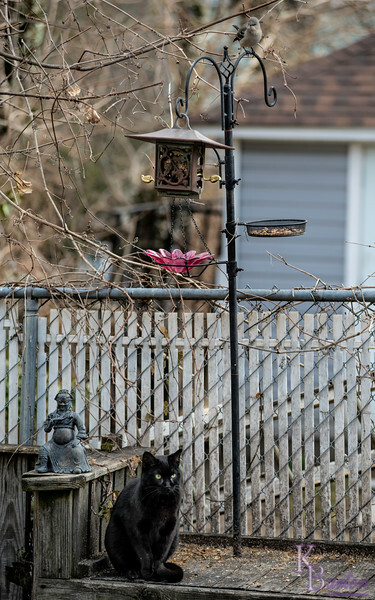 He (or she) is forever sitting near one of my bird feeders hoping to somehow catch one. But the birds see them a mile off and constantly go to one of the five feeders in my back yard that the cats are nowhere near at the time. Here he's so resigned to not getting to any of the sparrows in the tree above my feeder over my tool shed that he doesn't even notice this mockingbird sitting above his head, waiting for him to give up and leave so it can come down and finish off the food in it's favorite feeder.